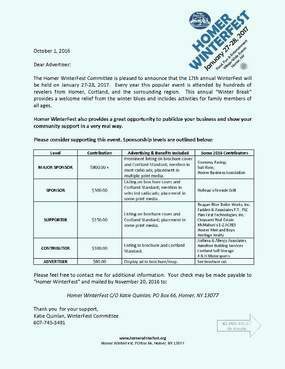 Homer WinterFest provides a great opportunity to publicize your business and show your community support in a very real way. Please consider supporting this event. We have multiple sponsorship and ad levels to fit nearly any marketing budget, from Major Sponsor level to $80 print ads in the widely distributed WinterFest brochure/map.